Two talented individuals found a vulnerability in our older game websites (specifically AdventureQuest, DragonFable, and MechQuest). We were notified of this on October 16th, 2018. Thankfully, they have worked diligently with us to fix these issues and protect our game network. Because we respect your privacy and the privacy of all our players, we are writing to let you know about this data security incident. While we have no evidence of your data being leaked, it is possible that your personally identifiable information was accessed, which for our games is limited to your game account name, password, email address, and IP address. The team investigated the vulnerability and took protective measures to ensure no other access was possible. Then, the vulnerability was patched, and the fix confirmed. We have notified all players who may have been affected via email and postings across our websites of the potential unauthorized access. In the days immediately following determination of the vulnerability, our programmers added additional protection to our network and accounts. While you are updating your password(s) to secure your account, be sure to download our new Artix Games Launcher. It is a far more secure way to play as you do not need the Flash Plugin or a web browser… and you can play all of our games in one place. If you need any help with any of your Artix Entertainment video game accounts, please contact player support. NEW! 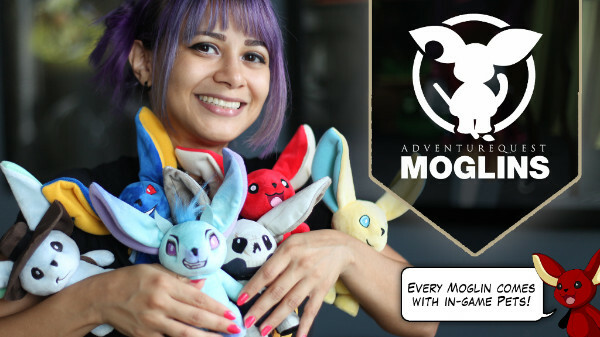 AdventureQuest™ Moglin Plushies Kickstarter is LIVE! [*]Fixed the heads on the Kindred, Necragon, and Giant's Might armours. [*]The temp Dragonrider armour from the Great Fire War time scroll is now properly tagged as a rider armour. [*]The Morningstar Emblem accessory now properly reduces Earth damage. [*]The boss rush in the Morningstar quest now properly saves between login sessions. [*]Updated the Black Dragon Rider armour in the Guardian Tower stables with brand new art and stats. [*]Made the Radiant Warhorse armour tier properly and not just give out the 150G version. Tibbles has returned to spread Summer cheer with a new donation contest - this time you can unlock the noble Thunderbird Set. With 5 amazing items to unlock, including an armor you can dismount and battle alongside your feathered mount, this is one set sure to make everyone's Summer brighter! Every Z-Token donated is randomly gifted to another player, so now is a great time to be enjoying AQ - as you could be gifted up to 5K Z-Tokens just for playing! NEW! 2018 Surfboard Design Contest! Summer is coming, and that means two things - one, SURF'S UP! And two, Surfboard weapons return to Artix Entertainment's games! This year, we're holding an all-game surfboard design. We'll take your ideas and turn them into works of KILLER (wave) art, dude! So hang onto your helms as you hang ten, and read on for the contest guidelines! All our regularly-updated games are participating in the contest. That means your entry has a chance to appear in AQWorlds, AQ3D, AdventureQuest, or DragonFable. Each of the game teams will choose their own Grand Prize Winners. Those Grand Prize winners will be created and added into the respective games over the next few months. Grand Prize winner(s) will be chosen by the game teams. GP Winners will get their design in game and 2000 Artix Points! Winners Circle entries will get 1000 Artix Points! The contest will range from today, May 4th until 10 AM EST on Friday, May 11th. The winners will be announced the following week on the AE Contests Twitter account. The rules and guidelines are pretty radical, but MUST be followed accordingly for your edible entry to be eligible. I repeat, in boldface and in red font, ‘cuz a lot of people miss this: YOU must follow EACH rule if you want your entry to be considered eligible. The easiest way to make sure your hard work gets judged: Read all of the rules before submitting your entry! Your entry must be made by you. Do not copy someone else’s hard work. That my friend is called cheating, and you will be disqualified for it. Include your game character name on the piece of artwork itself. If you want your entry to be considered for a specific game, write that game's URL on the image below your game name. If you do not include a specific game, your entry will be considered for all games. Your entry MUST be created in some sort of Artix Entertainment theme. Create anything you want from AQW, EpicDuel, BladeHaven, DragonFable, MechQuest, AdventureQuest, and WarpForce! If we cannot tell what it is from our games, you will not be qualified. The screenshot of your entry should be of the Highest Quality, and as large as possible. The more clear the picture, the better it will look, upping your chance at the Grand Prize! Uploading your photo to your Facebook and sending us a link does not allow us to see the photos. Also, if you upload your photo to your LOCKED image-sharing account, we cannot see it either. So make sure you send the image itself to the Twitter account linked above. One entry = one surfboard design... so make sure you are happy with your submission! Follow these links for surfboards template used in AdventureQuest Worlds and AdventureQuest. You do not need to use them, but you may find them helpful. On behalf of the entire AE team, we are really looking forward to seeing your creativity!